At the “Cucinare” tradeshow in Pordenone there was a display that had Sicilian pistachios in many forms from creams to flours or roasted salted whole pistachios. Of course I couldn’t resist the temptation to bring home a bit of that deliciousness. The cupcake that I propose materialized in my mind after being stimulated by this unique and delicious ingredient. The recipe is a real sin of gluttony with all accessory of calories that come with it. 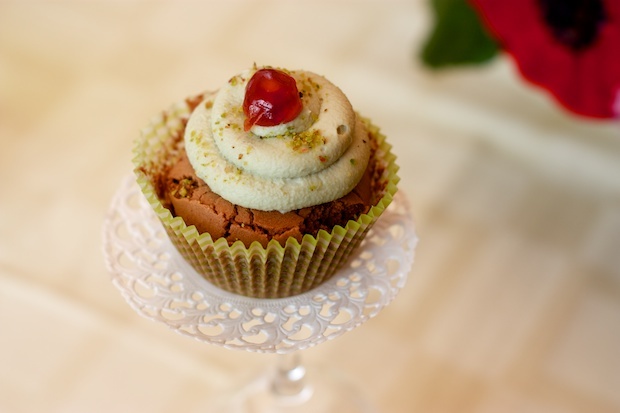 The dessert that I invented was inspired by American bakeries where you find cupcakes that are similar to our “pasticcini”. Break the chocolate in a saucepan and melt it over a water bath (the pot is suspended over a pot of boiling water, the pot should not touch the water). While the chocolate melts, work the soft butter with the sugar, adding a pinch of salt and the vanilla. When the cream is well mounted, break an egg inside and incorporate it, doing the same with the other eggs. If you have a electric mixer you can use and it will make all operations less tiring and the result will be excellent. After the chocolate has melted, add it to the butter mixture and continue stirring. Add the Grand Marnier and the two sifted flour and mix until you form a soft smooth cream. If you have a muffin mold, insert the paper muffin cups into the mold, otherwise use aluminum muffin molds. Insert the cupcakes into the oven and bake for 15 minutes. Before you turn off the oven, place a toothpick in a cupcake. If it comes out clean the cupcake is cooked otherwise continue cooking for 5 minutes. Remove from the oven and let the cupcakes cool. Meanwhile, prepare the cream. Working with a wooden spoon, mix the mascarpone with the pistachio cream and beat with a mixer for a homogeneous preparation. Put the mixture in a pastry bag equipped with a large nozzle. 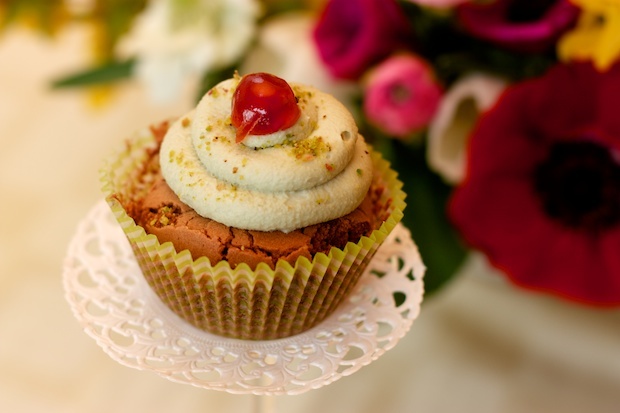 Form a spiral over the cupcakes and place half a cherry on top. Garnish with pistachio flour scattered here and there. In the picture you see that the cakes are rich in cream. With the doses of the cream in the recipe I was able to decorate 15 cupcakes, and the others I left them simple for those guests who do not like the creams in general. If you want to decorate all 24, use a smaller amount of cream. The cupcakes should be stored in the refrigerator.